This set of Engineering Geology Interview Questions and Answers for Experienced people focuses on “Classification of Faults – 02”. Explanation: The origin of horsts and grabens is believed to be due to lateral tension in the crust in most cases. Explanation: Faults involving extensive blocks and resulting in horsts and grabens are often called as block faults and the process as block faulting. Explanation: Faults in which the fault plane is vertical or nearly so and the resulting movement of blocks is also in a vertical direction are termed as vertical faults. It is customary to group vertical faults along with normal faults while discussing their origin. 4. In which fault the hanging wall appears to have moved up with respect to the foot wall? Explanation: Reverse fault is such a type of fault in which the hanging wall appears to have moved up with respect to the foot wall. Explanation: In reverse faults, the fault plane is generally inclined between horizontal and 45 degrees although reverse faults with steeply inclined fault surfaces have been also encountered. 6. What does the reverse fault cause to the crust of the Earth? Explanation: By virtue of their inclination and direction of movement, reverse faulting involves shortening of the crust of the crust of the Earth (compared with normal faults). 7. Thrust faults belong to which variety of faults? Explanation: Thrust faults are, broadly speaking, such varieties of reverse faults in which the hanging wall has moved up relative to the foot wall. 8. What is the fault angle of the thrust faults? Explanation: Thrust faults are the types of reverse faults in which the hanging wall has moved up relative to the foot wall and the faults dip at angles below 45 degrees. Faults dipping above 45 degrees with hanging wall having gone up are then called as reverse faults. Explanation: Thrusts are further distinguished into two sub-types: The over thrusts and the under thrusts. In the over thrusts, the hanging wall seems to have been actively and actually displaced with respect to a passive foot wall. 10. Which mountain range presents example of thrust faults? Explanation: The Himalayan Mountains in the Indian sub-continent present numerous examples of thrust faults developed all along its extension from northwest to southeast. 11. What is the term used for blocks or rocks that have been translated to great distances? Explanation: Nappes is the term used for extensive blocks of rocks that have been translated to great distances, often ranging to several kilometres, along a thrust plane. Explanation: The large-scale movement of nappes may be attributed to a major thrusting or a recumbent folding followed by thrust faulting. 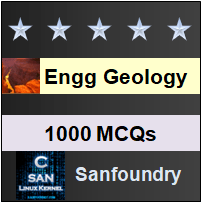 To practice all areas of Engineering Geology for Interviews, here is complete set of 1000+ Multiple Choice Questions and Answers.